Chris Felver, Ferlinghetti: A Rebirth of Wonder, 2009, HD video, color, sound, 79 minutes. Veteran of World War II and numerous revolutions, disciple of Charlie Chaplin and Jacques Prévert, publisher of “dissident thought” from, among countless others, Allen Ginsberg, Charles Bukowski, and Sam Shepard, and, as proprietor of San Francisco’s City Lights Bookstore, host to experimental, political, and international writers for six decades, Ferlinghetti has packed several lifetimes’ worth of experience and achievement into an admittedly long life (he is ninety-three). Christopher Felver’s thorough, reverential documentary Ferlinghetti: A Rebirth of Wonder attempts to distill it all into a manageable length, with talking-head encomia from Ginsberg, McClure, Billy Collins, Dennis Hopper, Robert Scheer, and others, but the amount of ground covered gives the film a feel of a travelogue, like a suitcase coated with such a dense palimpsest of destination stickers that the luggage itself disappears. Scheer recalls that Ferlinghetti was the calm in the middle of the storm of the “San Francisco Renaissance” in 1950s North Beach, and with his serene, avuncular manner and warm, wry grin, the poet remains something of a cipher despite the documentary’s detailed exposition of and commentary on his life. His beginnings were bleak. The son of an Ellis Island Italian immigrant who died before he was born, Ferlinghetti lost his mother to madness while he was still an infant. His aunt Emily took him to France for his first five years, only to return the child to New York City where, due to penury, he was removed from her care by social services and placed in an orphanage. Securing a job as a governess with the wealthy Bisland family of Bronxville, Emily brought the boy to live in the Bislands’ mansion, where he availed himself of the well-stocked library and learned to memorize and recite poetry at his hosts’ request. Emily eventually left and never returned, and the Bislands took him on, sending him to board at the Mount Hermon School after he was arrested for stealing pencils from a five-and-dime store. Inspired by Look Homeward, Angel (1929), Ferlinghetti attended Thomas Wolfe’s alma mater, the University of North Carolina, Chapel Hill. His wartime tours in the Navy included manning a subchaser on D-Day and visiting Nagasaki six weeks after the atom bomb had incinerated the city, an experience that made him an “instant pacifist.” Taking advantage of the GI Bill, he earned an MA at Columbia after a brief stint in the mailroom of Time magazine. He moved to Paris, fell in with future Shakespeare & Co. bookstore founder George Whitman, and studied for a doctorate at the Sorbonne. 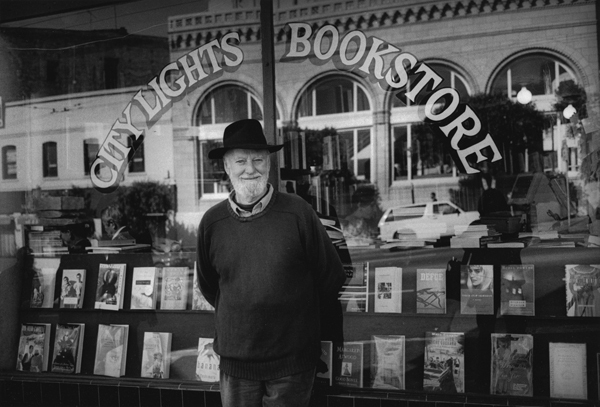 His education complete, Ferlinghetti returned to America, settling in San Francisco in 1953. That year, he founded City Lights with Peter D. Martin, who edited a journal of the same name, as the first paperback-only bookstore in America. Martin left two years later, and Ferlinghetti started the publishing arm of City Lights with his debut book of poems, Pictures of the Gone World, in what was to become the iconic Pocket Poets Series. Under this imprint, Ferlinghetti published works by, among others, Kenneth Rexroth, Gregory Corso, William Carlos Williams, and the volume that propelled him to national fame, Ginsberg’s Howl and Other Poems (1956). Ferlinghetti and his bookstore manager Shig Murao were arrested by the San Francisco Police on obscenity charges for publishing and selling Howl. Charges against Murao were dropped, but Ferlinghetti, backed by the ACLU, stood trial and won a landmark First Amendment case in front of a notoriously conservative, born-again Christian judge. The trial received international attention (Ginsberg remained in blissful “exile” in Tangier throughout), and secured Ferlinghetti a place in the small pantheon of renegade publishers who, like Grove’s Barney Rosset and Hustler’s Larry Flynt, significantly contributed to free-speech law in this country. It also made him a patron and mentor to the emergent Beat generation of writers, an association that defines him to this day (though he rejects the label for his own work). Ferlinghetti: A Rebirth of Wonder opens February 8th at the Quad Cinema in New York.